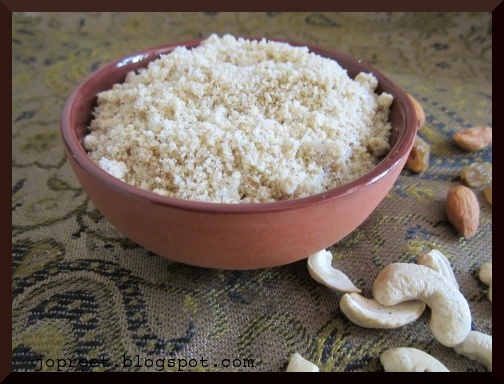 Badam milk powder, learn how to prepare Badam nuts powder for toddlers and adults. This powder can be used in milkshakes, lassi, juices, baking and making Indian desserts. You can store it in fridge for a month. But if preparing for the kids, it’s better to not store then more than a month. You can prepare in small batches and store up for a week. Almonds are rich in vitamin E. The health benefits of almonds include getting relief from constipation, respiratory disorders, cough, hearth disorders, anemia, impotency, and diabetes. Almonds contain the most nutrients in comparison to all other nuts. They contain oxalates and excessive oxalates can cause crystallization. So people having kidney or gallbladder problems should avoid eating almonds. Grind all the ingredients in a mixer to smooth powder. Allow to cool and store in an air-tight container. Mix 2 tbsp powder with cold/hot milk and serve it. You can also use this powder in kheer/burfi. Healthy milk powder Preethi, i too have this in my blog, but mine is a different version. Very healthy and useful milk powder. New to me dear.